A number of publications on Tibet have created confusion regarding the historical status of the Tibetan national flag. Without qualification, these works assert that the flag was simply a "regimental banner” used by the Tibetan army and later promoted to the rank of a national flag by Tibetans in exile. This claim ignores a vast selection of scholarship, primary sources, and visual documentation to the contrary. These works also carelessly omit the fact that the flag was internationally recognized and even well known as the national flag of Tibet long before Tibetans came into exile. The history and international recognition of the Tibetan flag has been well documented. As Tibetan writer Jamyang Norbu points out, before 1959, the flag was used to represent Tibet in international diplomatic affairs and was featured widely from an official British Crown publication in 1930 to National Geographic’s “Flags of the World” issue in 1934. One previously unexplored example of the flag’s international popularity was its use on collectable trading cards. 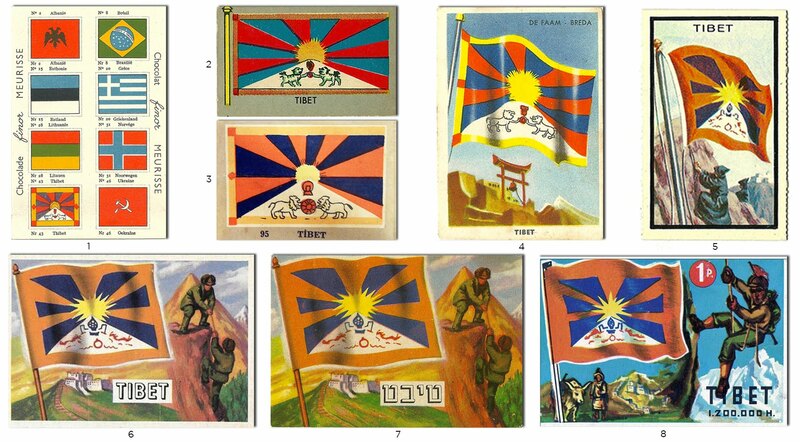 Beginning in the late 1920s, images of the Tibetan flag were widely published by companies in Europe, North America, South America, the Middle East, and Oceania in national flag trading card collections. 1) Abadie Zigarettenpapier Ltd. 1928. 2) Massary Zigarettenfabrik, 1929. 3) Bulgaria Zigarettenfabrik, 1933. 4) Tabakmonopol Danzig, 1933. 5) Monopol Zigarettenfabrik, 1936. 6) Kosmos Zigarettenbilder 1950, 7) Cento Tobacco Company, 1950. 8) Kane Products LTD., 1958. 9) Sweetule Products LTD., 1962. Vlaggen Van Alle Landen, De Faam, Breda, Netherlands, 1952. Following the success of cigarette cards, chocolate manufacturers also began issuing collectable cards. In 1938, Chocolat Meurisse, a Belgian company included a Tibetan flag with their collection, “The Costumes of Nations.” After World War II, which halted card production due to paper shortages, it became common for candy packets of all types to include trading cards that were often their selling point. 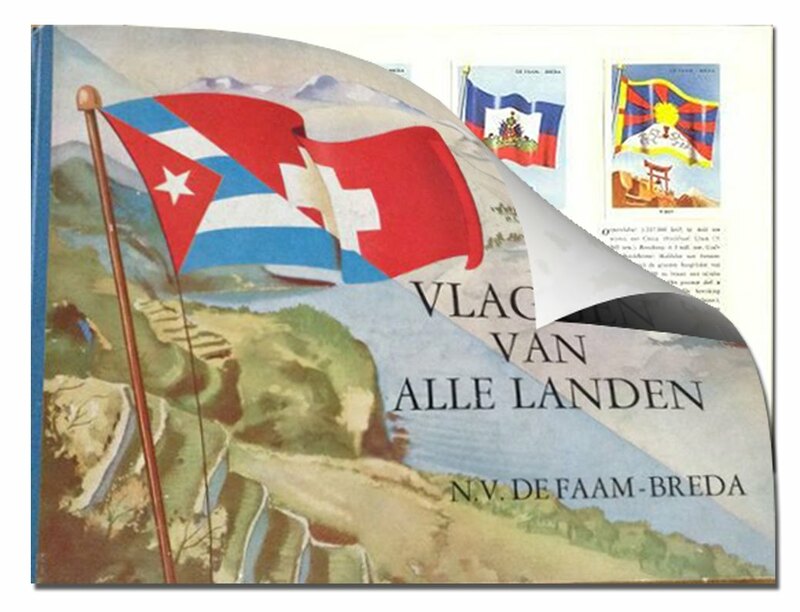 One Dutch peppermint company, De Faam, published a series of cards with an accompanying book titled “Flags of all Countries” in 1952. 1) Chocolat Meurisse, 1938. 2) Topps, 1950. 3) Baylan Pastaneleri, circa 1950. 4) De Famm, 1952. 5) Topps, 1963. 6) Topps, 1956. 7) Topps-designed card in Hebrew circa 1959. 8) Saiem, circa 1957. In 1950, 1956, and 1963, the popular American company Topps, printed three different Tibetan flag cards. Their 1956 “Flags of the World” card was used by a number of companies in Europe and the Middle East and translated into several languages. One example of the 1956 card can be seen above printed in Hebrew. Similarly, “Tibet” is spelled with a dotted “İ" from the Turkish alphabet on the above card from Baylan Pastry, a Turkish chocolate company. Other cards were also sold in coin-operated vending machines with gumballs such as the one printed by Saiem circa 1957 in France. 1) Eucalol, 1935. 2) Birkel, 1952. 3) Veen, 1954. 4) Agência Portuguesa de Revistas, 1957. 5) Sanitarium, 1959. 6) Gouda’s Roem, 1950. 7) Nannina, 1961. 8) Saiem, 1959. 9) Minepba,1961. 10) Golden Glow Sales Corp., 1963. Outside of Asia and Europe, the earliest example of the flag’s use was perhaps in 1935 by Eucalol, a popular Brazilian soap company. Eucalol enclosed flag cards with soap boxes of from their series “Flags of the world.” Similarly, in 1950, a Dutch food company, Gouda’s Roem, included Tibetan flag cards with with boxes of butter. Birkel, Germany’s principal noodle manufacturer in 1952 published a magazine titled “Countries and Flags” which included a card with the Tibetan flag before an image of the young Dalai Lama. In 1954, the Dutch publisher Veen, produced a collectable cards book titled “Flags and Postage,” which included a card with the Tibetan flag above a Tibetan government postage stamp. The Agency of Portuguese Magazines also included the flag in their 1957 educational magazine, “Flags of the Universe,” which contained removable trading cards. The same card was also featured by the Brazil-America Limited publishing house in their “Flags and Typical Costumes” magazine later that year. The New Zealand-based health foods company, Sanitarium, enclosed a Tibetan flag card from their 1959 “National Flags and Costumes” series with breakfast cereals. The flag also made several appearances in Greece on at least 3 different cards around this time. One such card can be seen above with “Tibet” spelled using the Greek letter “Θ” (theta). Several Dutch and German companies even featured the flag on collectable card-like matchbox labels. Various Tibetan flag matchbox labels 1950-60. The circulation of these trading cards show that there was a vast international recognition of the Tibetan flag. Although reflecting the orientalist and romantic aura that is often built around Tibet, these trading cards nonetheless unveil the absurdity of the claims of historians like Patrick French (2009) and Melvyn Goldstein (2009) that the Tibetan flag was simply a regimental banner and later promoted as a national flag by Tibetans in exile. While the proliferation of nations was a defining feature of the 20th century, since much of the world was struggling for national recognition, Tibet’s national symbol, had long been recognized. Only after the colonization of Tibet, would this historical fact be distorted by revisionist historians and writers. 1. Goldstein, Melvyn C.; Jiao, Ben and Tanzen Lhundrup. On the Cultural Revolution in Tibet: The Nyemo Incident of 1969. University of California Press. 2009. p. 209. 2. French, Patrick, Tibet, Tibet. Knopf Doubleday Publishing Group, 2009. p14-15. 3. Norbu, Jamyang, Independent Tibet, The Facts. 3rd ed. High Asis Press, March 2011. p. 3. 4. Crane, Ben, A Brief History of Trade Cards, The Trade Card Place, n.d. Web. 26 Feb. 2015. 5. "It's on the Cards." Card History. The London Cigarette Card Company, n.d. Web. 26 Feb. 2015.